An informational brochure on AOCNC is available below for association clubs to let their members know what AOCNC is all about. 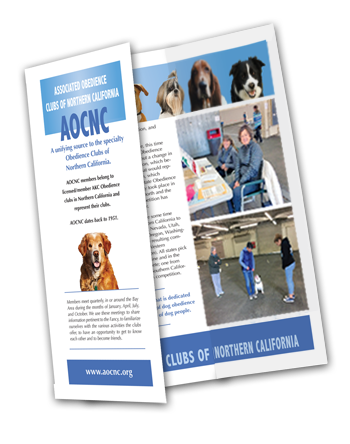 The brochure includes a $10 discount certificate good toward a first ever dog class at a praticipating AOCNC member club. See brochure for list of participating clubs. This is a great way to encourage newcomers to take classes at AOCNC member clubs! When information in the brochure changes, the brochure will be revised. Date of change will be indicated on the back. Check back from time to time to assure you are sharing the most current version. NOTE: When printing PDF, make sure page scaling is set to NONE. Otherwise images will not align correctly when brochure is folded.